No one was more surprised than I was when my fifth-grade son came home one day and asked if he could learn to play the trumpet. We’re not a musical family, and he’d never expressed any interest in music. The band teacher at his elementary school had done a presentation for his class, and he was sold. It was a bumpy road at first. Getting a 10-year-old to practice the trumpet regularly wasn’t easy. And if you’ve ever heard any beginner on an instrument, you’ll understand why we sometimes asked him to practice outside on our back porch. At the end of sixth grade, he was ready to quit. But I encouraged him to stick with it through middle school. After that, I said, you can leave the trumpet behind. The middle school band program worked its magic on him. By ninth grade, not only was he continuing in band, but he also joined the high school marching band. At first, I was wary of the marching band, which dominated my son’s life from August to November. I worried it would take time away from baseball, which he also loved. Slowly, the world of dinkles, dot books, and drills took hold in our household. By sophomore year, my reluctance evaporated, and I was all in. I sold cookie dough and pies, arranged for restaurant night fundraisers, and hauled vanfuls of teenagers to tag day and leaf-raking jobs. I cheered loudly on the sidelines at football games and at competitions. I sold hot dogs and chili at the concession stand. In my son’s senior year, I served as vice president of our band boosters organization. When I was a newspaper reporter, I covered my share of school budget stories. I was single and had no children. As communities debated budget cuts, I never understood why parents so passionately defended strings and band programs. They seemed like a luxury to me, not a necessity. I couldn’t have been more wrong. We did, of course, have the resources to get him private lessons. But without the exposure at his elementary school, he never would have asked. My son became part of a tight-knit group of friends who worked together, traveled together, and played together, and he thrived. In his senior year, he earned the leadership role of brass captain, and he made second chair in the school’s highest-level band. None of this would have happened without his elementary school band program. My son graduated from high school in June. 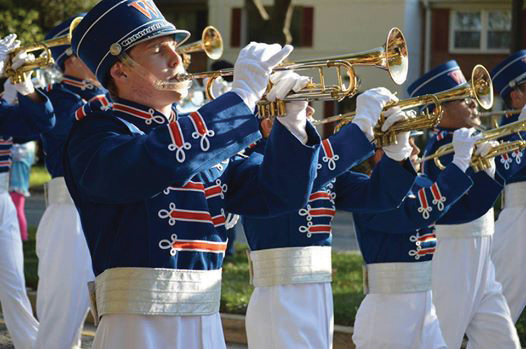 He’s headed to college this fall, with his trumpet, to become a member of the college marching band. He is only one of thousands, if not millions, of examples of how essential so-called noncore, elective, and extracurricular activities are to the lives of our students. This band mom will be forever grateful for the opportunities provided by our public schools.